Your pet is part of your family and you would do anything for them, but they can be a handful and get into some trouble from time to time. You want to keep them safe and healthy while keeping your home in great condition at the same time, because of this it is important to understand the relationship between your pets and plumbing. You may be wondering what these two things have to do with each other, and you may be surprised to find out that there are a ton of connections between pets and plumbing. These two things can negatively affect each other if you do not take precautions. Our team at Cupertino Plumbing know how important pets are to so many families. That is why we wanted to give you more information about your pets and plumbing and some tips to follow to keep both safe and in great condition. Our professional plumbers can provide you with a variety of services to help with your plumbing needs. If you ever need plumbing services in the San Jose area be sure to contact Cupertino Plumbing and read this blog to learn more about your pets and plumbing! While it may not seem like a big deal to leave the toilet seat open, it can become a problem when your pets are involved. Especially if you often catch your dog or cat drinking from the toilet bowl. While it may seem harmless (if the water is clean) it can actually be harmful to pets. If you use a chemical cleaner, those chemicals can linger in the bowl, leaving a residue that can hurt your pets if they ingest it. This is why it is important to close the lid to the toilet when it is not being used. Try to get your entire family to follow this new rule, it could end up keeping your pets safe! And if you forget and see your pet drinking out of the toilet, don’t just shrug it off. Stop them and make sure to close the lid and ensure their water bowl is full. If you give your pet baths in the tub or sink, you will want to invest in a quality drain stopper. Your dog or cat will lose a lot of hair while you bathe them, which can become a huge problem if it makes its way down your drain. 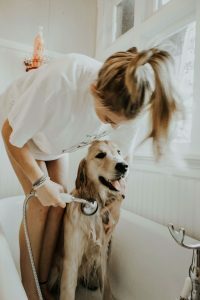 While human hair shouldn’t go down your drain either, pets shed a lot more than people, so if you don’t have a drain stopper or strainer in your tub or sink regularly, we strongly suggest using one when you give your furry friend a bath! If the fur from your dog or cat makes its way into the drain, it could cause clogs that worsen over time. Avoid the nightmare of clogs and backed up drains and add a drain stopper to your tub or sink! Some cat litter packaging claims that it is “flushable” but we highly advise you to avoid throwing kitty litter into the toilet. This could lead to clogs in your toilet and cause more problems than it’s worth. To avoid this, simply throw all kitty litter into a bag to dispose of it, even if the packaging says otherwise. Some pets have a problem chewing on household items, shoes, and other things that they should not be chewing on. While it is annoying and frustrating to deal with, it really isn’t that big of a deal in the long run. One thing that you certainly don’t want your pet chewing on is pipes! You may not expect your pet to chew on pipes, but it is better to be safe than sorry. When your pet chews on pipes they can cause damage that will cost you quite a bit to repair, plus it can be harmful to your pet. Simply covering those exposed pipes can help you avoid both of these situations. One of our plumbers will be able to help you determine what the best material is for covering your pipes. While it is likely that you try to stop your dog from digging in your backyard in general, you will certainly want to make sure they are not digging too deep. Sometimes, water and sewer lines may not be buried beneath the surface as far as you think. While it is rare, your water and sewer lines may only be about 18 inches below the surface. If your dog is a digger, make sure they never get deep enough to puncture your water or sewer line, this could be a costly repair. Try to stop your dog from digging in general and you will never have to worry about this! When your dog rolls in mud, be sure to rinse them off outside with the hose before finishing their bath in the tub. This can help remove clumps of mud and matted fur from your pup before you bring them inside. 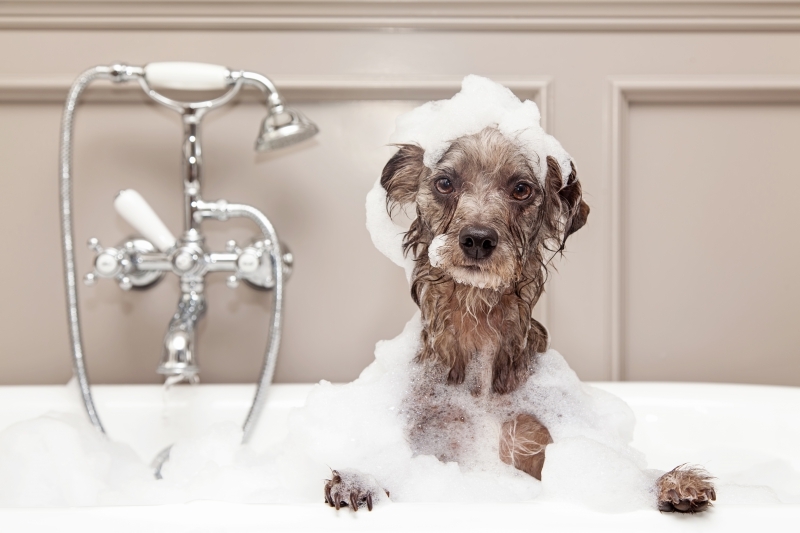 If you simply stick your dog in the tub and start their bath, the mud and hair can quickly lead to a clog. You do not want the mud and dog hair going down the drain and the best way to avoid this as much as possible is to rinse them off beforehand! And also be sure to remember our first tip, this can help keep your drains clog-free as well! Your pets and plumbing are more connected than you may have thought and there are many things you can do to make sure your pets stay safe and your plumbing stays in great condition. Now that you understand the relationship between these two things, you can better prepare and take precautions. Hopefully, this blog has helped you learn how to take care of both! If you ever need plumbing services in the San Jose area, be sure to contact Cupertino Plumbing! We offer a variety of services and can help you with your plumbing problems.